From birthday and anniversary surprises, to wedding carriage rides, Wagoneer World continues delivering dreams to enthusiasts across the world. Our most recent surpise reveal for a client happened close to our location in Dallas during "Red Rivalry" weekend (October 2013). The result was one very happy birthday moment when a long-time dream vehicle wish was fulfilled. We can take care of the details for delivering a dream Woody Wagon to you or a loved one -- just let us know what, when and where and we'll take care of the rest! On site for an advertisement for a national retailer, this Wagoneer World Jeep is ready for "back to school." Look for this WW wagon in an October 2013 national ad flyer ... let us know if you spot it! In addition to driveways across the land, you can also find Wagoneer World Wagons on TV, in magazines, and in advertisements. In 2013 alone, our Jeeps have appeard in TV and print ads. Our Jeeps, along with many others owned by enthusiasts continue to be showcased in various venues, shows and ads. Our inventory is available for local shoots, but if yours has been featured drop us a line and let us know. You can also submit Woody sightings for our "Spot A Woody" page. This beautiful 1991 Final Edition Jeep Grand Wagoneer from Wagoneer World toured the USA as part of the fun and excitement of college football. The tour began in Arlington, TX when the season kicked off at the Cowboys Classic featuring Alabama vs. Michigan. The tour continued each week as this Grand Waggy followed the ESPN College GameDay crew all season. Let us know if you ran into this Jeep while tailgating. the story of DISCOVERING the Hamilton Collection! You know the one … the dreamer tracks down a chance lead that turns into a “barn find” –the discovery and subsequent purchase of an original, low-mileage vehicle of their desired vintage that has been preserved, but somewhat forgotten in a remote barn or shed just waiting to be found. Imagine our delight, as a specialty business passionately focused on preserving, restoring and selling Jeep Grand Wagoneers and honoring them as an American classic, to uncover the details of a private collection of over 30 Jeep Grand Wagoneers! It’s the dream, times 30+! 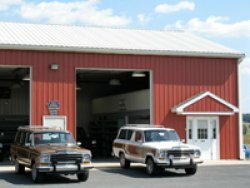 Although this collection was carefully maintained and housed in quarters far superior to a dusty old barn, discovering this astonishing collection and the unique Wagon Tale of the man behind it, was a dream come true for us at Wagoneer World. Through our passion for Grand Wagoneers, we were able to live the dream of this “Grand” treasure by sharing it with all Jeep Grand Wagoneer enthusiasts across the world. Wagoneer World was chosen as the exclusive representative to facilitate the sale of this unique and special collection --- presumed to be the largest private collection of Jeep Grand Wagoneers in the world. Dubbed the “Hamilton Collection,” this exquisite, historic collection was meticulously grouped together by private owner Al Hamilton and includes more than 30 Grand Wagoneers. When Mr. Hamilton made the decision to sell the bulk of his collection due to changing priorities in his life, his Jeeps became available to other enthusiasts who appreciate the beauty, drive and comfort-ride offered by a high-quality Grand Wagoneer. It was our great pleasure both behind the scenes beginning in 2008, and in 2009 when the marketing of the Hamilton Collection was launched to our friends, clients and fellow Woody enthusiasts. Collection owner Al Hamilton first came to appreciate the classic styling and workhorse beauty of Grand Wagoneers many years ago when purchasing Jeeps new for his foremen to drive on the job in the rugged coal mining country of northern Pennsylvania. Later, a few years after retiring from the coal business, Mr. Hamilton missed the looks, ride and drive of a Grand Wagoneer to the point he sought out an original condition, low-mileage one to add to his collection of other vehicles. 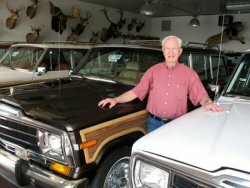 From that beginning, his love for the Grand Wagoneer resulted in a handpicked collection that grew to its current level of more than 30 high-quality Woodys. But the path to becoming the owner of an unequalled collection of Grand Wagoneers is a Wagon Tale unto itself. Respected as a successful businessman with an entrepreneurial bent, Al Hamilton and his childhood sweetheart and late wife, Betty, also became well known for their charitable work. Their legacy of success and generosity can be traced back to their own humble beginnings. Both grew up in large, coal mining families who struggled to get by. Al began working in the coalmines at age 15 with his father. Over the years, Al parlayed hard work, determination and faith into starting and building a company that eventually became the third largest bituminous coal producer in Pennsylvania. After retiring from the coal business, Al focused on his family, his passion for Sprint Car racing and tending to his growing real estate investments. This included the creation of another business that has served the Manheim Auto Auction, the largest auto auction in the world, by providing storage, office and parking space. “It has been a wonderful relationship with the auto auction, and just like the coal business, we started out small and grew,” said Al. A car enthusiast at heart, Hamilton built an impressive collection of vehicles even beyond his Grand Wagoneers. In addition, after more than 30+ years as a Sprint car owner, he was enshrined into the National Sprint Car Hall of Fame and Museum in Knoxville, IA years ago. “Machinery, from cars and Jeep Grand Wagoneers all the way to large earth-moving equipment has been a part of my life for as long as I can remember,” said Al. “I still have my first coal shovel and love to get in a bull dozer or backhoe and move dirt, which I do almost daily. I see beauty in machinery of all types, but certainly the classic look, feel and drive of a Grand Wagoneer is second to none and holds a special place in my heart.”Comprised of more than 30 Jeep Grand Wagoneers, the historic Hamilton Collection has Jeep Grand Wagoneers from a wide range of years, colors, mileage and prices. The Collection is housed in Class A indoor storage with staff on hand to care, maintain, and refinish Jeeps in the collection as needed. 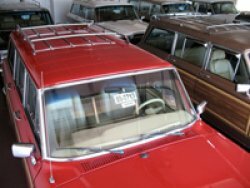 While the entire collection was not made publically available for sale, Wagoneer World exclusivley offered 25+ Jeeps in years ranging from 1983 to 1991. The last Jeep from the collection was a 1989 Woody sold in 2011. Classic 1967 Wagoneer World Jeep as seen on the big screen! From the big screen to the driveway of Jeep enthusiasts across the world, Wagoneer World Jeeps weave throughout many Wagon Tales. 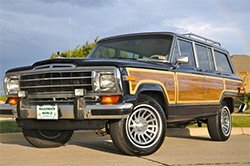 For example, viewers of the 2010 box office movie, "The Lovely Bones," featuring notable Hollywood actors Mark Wahlberg, Rachel Weisz, Stanley Tucci and Susan Sarandon undoubtedly noticed another unique staple of the movie -- a 1967 Jeep Wagoneer! Straight from Wagoneer World's certified reconditioning to the movie set, this particular Jeep featured a unique history with only 42,000 original miles and two owners prior to going Hollywood. In the movie, the Wagoneer plays a role as the vehicle for the "creepy villain" character, however for those of us who enjoy seeing a Full Size Jeep Wagoneer get air time, it is a must-see flick.